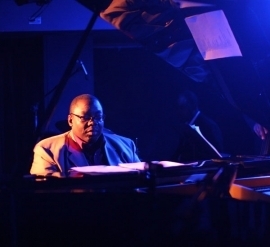 Born on January 17, 1963, in Baltimore, MD; son of McDonald (a retired post office employee and church organist) and Flossie (a city social services worker and church choir director) Soulful jazz pianist Cyrus Chestnut might just be proof positive of the impact that music has on babies in the womb. Either that, or a life in music was simply in his blood. Chestnut’s father, a postal employee and the son of a church minister, was the official organist for the local church in Baltimore, Maryland, where Chestnut grew up. Young Cyrus’s home was filled with the sounds of the gospel music that his church-going parents played in their home, along with jazz records by artists such as Thelonius Monk and Jimmy Smith. Chestnut has said that the roots of his love of music began there, and to this day, Chestnut’s ties to the gospel church remain constant. After graduating from Berklee College of Music in Boston, Chestnut went on to work with jazz vocalist Jon Hendricks from 1986-88, and trumpeter Terrence Blanchard and saxophonist Donald Harrison from 1988-90, before joining jazz legend Wynton Marsalis in 1991.